After yesterday’s lip smacking “Yakhni Biryani” , I am back here today with another Ramadan special dish, Sheer Khurma. 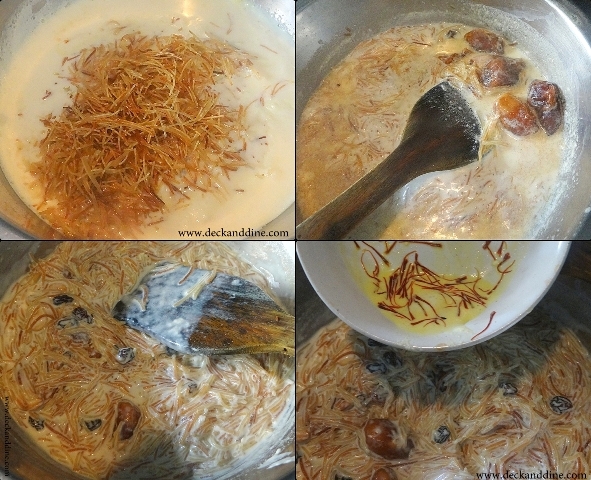 Sheer Khurma, which literally means milk with date, originates from the Sanskrit word ‘Sheer’ which stands for milk and the Urdu word ‘Khurma’ which means dates. This used to be a famous Ramadan/Eid special dessert made by my friend’s mother and I have so many fond childhood memories associated with it. Hearts filled with longing as the scintillating smell of sweetened milk and ghee roasted nuts wrapped their home. Lets begin by heating ghee in a pan. Once the ghee melts, add the raisins. Fry the raisins till then turn dark and plump up. Then add the cashew nuts and fry a little. I fried both the raisins and nut together. Take them out of the pan. Into the same ghee add the vermicelli and roast on low heat until the vermicelli turns golden burn. Boil milk and add the roasted vermicelli to the boiled milk. increase the heat and allow the milk to come to a full rolling boil. 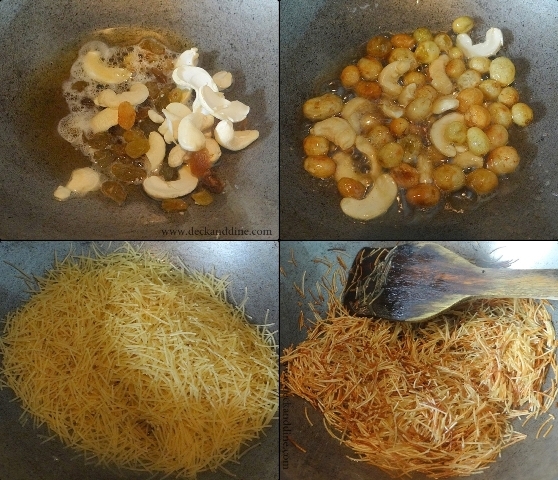 Simmer and put in the fried dry fruits and soaked dates. Keep the milk on medium flame till the milk thickens. You can add condensed milk if you want it creamier. Add sugar, stir for about 2 minutes more. I like my sheer khurma a bit thick, you can adjust the consistency to your liking. Do try and let us know..
Madhu invites me some time!